The HexPro Termite Baiting System is the next generation in termite baiting. It is one of the most widely installed bait systems by professional pest control companies today. Unlike older bait systems, the HexPro bait stations have larger vertical slots that allow for maximum wood-to-soil contact, creating the perfect opportunity for termite attack. HexPro Termite Baiting stations also provides an environmentally sensible solution with minimal amount of termite bait. It has low toxicity to birds, fish and plants, low impact on human health and has low potential for groundwater contamination when used as instructed. This system requires no trenching or drilling in floors. Each station contains a wood base monitor that is very appetizing to termites. When termites are found in the stations, the cartridge is replaced with a termite bait (Shatter) that wipes out the entire termite colony. 10, 15 or 20 Termite Monitoring Stations that each contain a wood base monitor. These stations are to be placed 8 - 10 feet apart around the outside perimeter of a home but not more than 20 feet. Larger homes will require more stations. 6 Termite Bait Cartridges for use when termite activity is present in the stations. 1 Key comes with the Kit of 10 stations and Kit of 15 stations. 2 Keys come with Kit of 20 stations. This Key is used for opening the monitoring/bait stations. NOTE: Every station comes with an extractor piece already installed in the station for easy removal of the wood monitor. Using a bait system around your home is a great preventative treatment for termites. Their main purpose is to stop termites coming from the yard, and into your house. The HexPro Baiting System is a great choice to stop termites before they infest your home. Unlike older bait systems, the HexPro bait stations have larger slots that allow for maximum bait to soil contact. This allows for better and more accurate termite monitoring. Before installing the stations, make sure to read the product label completely. The first step is to install the stations into the ground every eight to ten feet around the perimeter of your structure. They should be placed two to four feet away from the foundation but you can place the stations as far as 20 feet from the structure if decks, sidewalks, porches or landscaped areas prevent closer baiting. Make sure the placement is not under the drip line from the roof of the structure. The top of the station should be flush with the soil surface. The spacing between stations can be reduced if Termite activity is known in a specific area and is heavy. Here’s a pro tip! Install the bait stations following landscape plantings. These areas usually contain mulch or some sort of ground covering which will contain lots of moisture. This makes ideal conditions for Termite activity. Second step, if there is termite activity present, you should replace wood cartridges with Shatter Termite bait cartridges. Don’t bait unless you have termite activity. When an infested HexPro Termite Station is baited with Shatter termite bait, it’s strongly recommended that one or more auxiliary stations be placed and baited as well. This will increase bait volume and maximize bait consumption. Refer to the Shatter Bait product label for further details. Third step is to up the chance of bait consumption. You can enhance the chance of consumption of the Shatter Termite Bait by adding about an ounce of water or sugar based drinks, like sports performance drinks, to the recruitment chamber of the bait cartridge. To do this, make sure you leave the plastic wrapper on while filling up the bait tube. Let it soak into the bait, then take the plastic wrapper off before adding it to the bait station. If you’re installing stations in arid or dry climates, add up to two fluid ounces before introducing termites to the chamber. Here’s another pro tip! Take the monitoring device that was being fed upon in an infested station, and tap some of the termites into the bait tube. This is called self recruitment. It will cause about 30% more feeding on bait tubes. Termites will eat their way out and take the poison to the colony which will start the elimination process. Fourth step is to check baited stations every 30 to 90 days to see if termite activity is detected or has stopped. When activity stops, Shatter termite bait can be removed and replaced with a wood monitor. Repeat the process as needed. If you are dealing with Formosan Termites, stations should be checked more often, about once a month, because these termites consume more bait. Fifth and final step, is to replace the wood monitor as needed. Wood that is soggy or moldy should be replaced as soon as possible. And it’s that easy with the expert help from Do My Own Pest Control dot com! Subscribe to our channel for more DIY and product videos! The HexPro Termite Bait System is the next generation in termite baiting. The termite bait station features vertical slots that allow for maximum wood-to-soil contact, creating the perfect opportunity for termite attack. Each station contains a wood monitor that is appetizing to termites. Stations should be checked monthly, bi-monthly or quarterly. If termite activity is observed in one or more stations, the wood monitor in those stations should be replaced with a Shatter Termite Bait Cartridge containing the active ingredient hexaflumuron. Hexaflumuron is an insect growth regulator that stops the termites’ vital molting process so they are unable to grow. As a result, they die. Hexaflumuron has demonstrated 10 years of in-field success killing, controlling and eliminating termites. The HexPro Termite Bait System - Pro Kit allows for accurate monitoring and localized treatment before termites reach the structure. Subterranean termites - (not drywood) termite species in the continental United States and Hawaii. It does the job in varying soil, climate and geographic conditions. Install around the perimeter of homes and commercial buildings. Stations are placed in the ground (usually with a post hole digger or shovel) every 8 - 10 feet around the structure. The stations will attract termites before they ever reach the structure, allowing you to bait, eventually killing the termites. Monitor the stations on a monthly, bi-monthly or quarterly basis. If termite activity is present, replace the wood monitor with the Shatter Termite Bait. 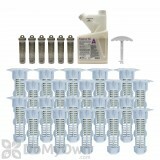 The HexPro Termite Bait System Kit should be used for prevention. Installing bait stations alone will not treat termites that have already infested a structure. If used in conjunction with a liquid termite treatment (See Subterranean Termite Treatment Guide), use only non-repellent termiticides such as Termidor SC. 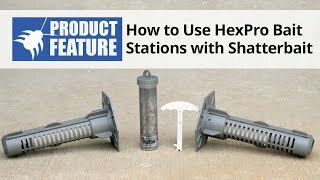 Install HexPro Bait Stations into the ground every 8-10 feet around the perimeter of the structure. Stations should be placed 2-4 feet away from the foundation, but not directly under the drip line from the roof of the structure. Hex-Pro Termite Stations should be placed in the soil such that the top is flush with the soil surface. For ease, the monitoring device should be in place and the station top cap secure at the time of installation. Monitor stations every 30 - 90 days for termite activity. If termite activity is present, replace the wood monitor with a bait cartridge containing Shatter termite bait according to Shatter label instructions. Additionally when termites or termite activity are detected in a monitoring device, install one or more additional Hex-Pro Termite Stations (auxiliary stations) in the soil within 6 to 12 inches of the infested station, if feasible. When an infested Hex-Pro Termite Station is baited with Shatter termite bait, it is strongly recommended that one or more of the auxiliary stations be baited with Shatter termite bait to increase bait volume and maximize bait consumption. See Shatter product label for details. Termite feeding on Shatter termite bait can be enhanced by adding a minimum of 0.7 fluid ounces (approx. 20 mL) of water or a sugar-containing solution such as a sports performance drink to the recruitment chamber of the bait cartridge. In arid areas and in dry soils, add up to 2.7 fluid ounces (approx. 80 mL) of water or sugar-containing solution before introducing termites to the chamber. Inspect active bait stations every 30 - 90 days to see if termite activity has stopped. When activity stops, Shatter termite bait can be removed and replaced with a wood monitor. Repeat process as needed. Replace the wood monitor as needed. Wood that is soggy or moldy should be replaced as soon as possible. Easy to install but when it rains a lot of em POP UP out of the ground due to the water level of the ground. Im hoping they will still work after being soaked by so much water..??? Just installed these around a home that has had termite damage. They were relatively easy to install. I used a solid 1" rebar to start the hole, then pounded a 1 1/2" pipe into the hole with a sledge hammer. Although they seem somewhat cheap, they withstood me "finishing off" flush in the ground with a hammer and a wood block. I don't know how they work and hope I never do. I work in the turf industry and DOW has trusted products. I read some reviews about heavy rains making the bait stations pop up out of the ground and that's exactly what happened to mine about a week after installing them. The more it rains the more they pop up out of the ground. I think the stations would probably work as intended if it weren't for this issue but I have a hard time believing any termites will find their way to the stations if they're constantly under water. Not trying to rip the product and the company is great, just don't think this product works real effectively. 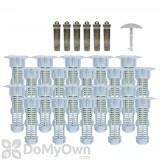 What is the diameter of the part of the HexPro Termite Baiting System that goes in the ground? I need to know how big of a diameter of hole I need to make. The diameter of the HexPro Termite Baiting System Station is approx. 1 and 1/2 inches. Do the HexPro Termite Baiting Systems kill the termites or just lets you know they are there? I was planting and found termites in the soil very close to my house. I would like to know best way to get rid of them. 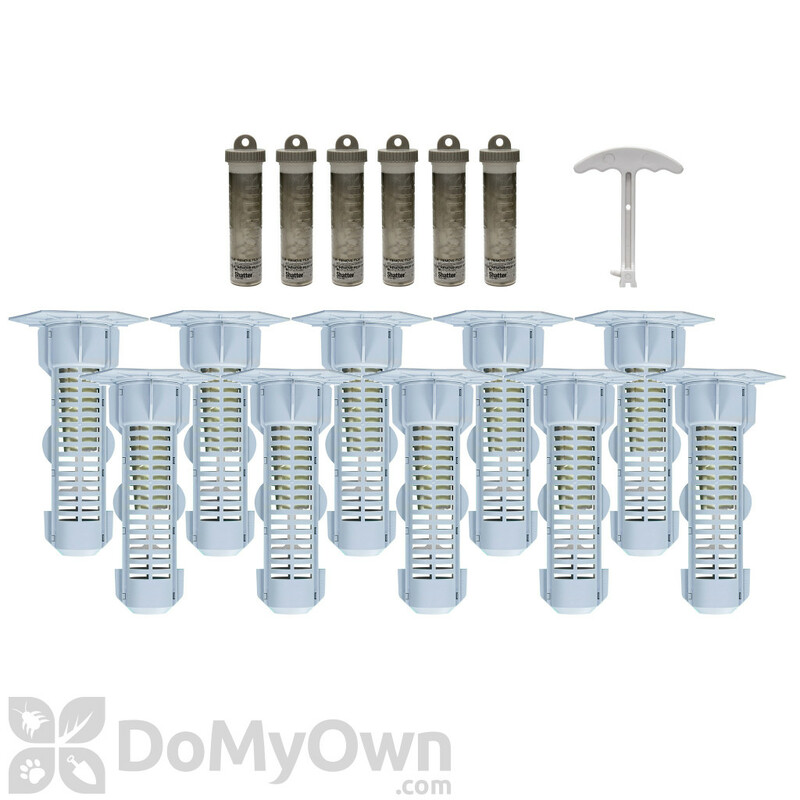 The Termite Baiting System Kits are put down to monitor activity around the home first and if a termite colony finds its way into one of the stations, then you would put one of the poison bait cartridges into that station only to eliminate the colony that is there. Does the HexPro Termite Bait System come with 6 or 12 shatter baits? 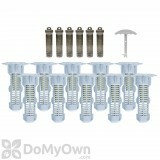 The HexPro Termite Baiting System comes with six Shatter Baits. 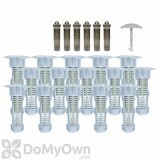 Can HexPro Termite Baiting System- Pro Kit be used where landscaping plastic is also being used? In my flower bed I'm using landscaping plastic for weed control. I read the product label and saw place stations every 8 to 20 feet and 2 to 4 feet from the foundation. Can I poke holes in the plastic and extend the station in to the ground? Yes, you can use the HexPro Termite Baiting System - Pro Kit with landscaping plastic. You would cut a hole in the plastic to accomodate the station in the ground, and it would fit flush against it once it is installed. The stations would still be effective as long as they are buried in the ground as stated on the product label. How big are the HexPro monitoring/bait stations? How big are the monitoring/bait stations? The HexPro Termite Bait Station is 3.5in x 3.5in x 8in long.